Mark, Andy and Paul had a big day on the Muskegon River Steelhead fishing today. 3/31/2011 Paul with a fresh hen from the Muskegon River. 3/31/2011 Andy with a Muskegon river steelhead. 3/31/2011 Mark with a hard fighting buck. 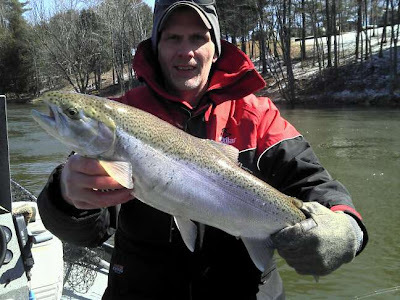 3/31/2011 Muskegon River Steelhead fishing has been fantastic!! 3/31/2011 Fresh from Lake Michigan, Muskegon River Steelhead. 3/31/2011 Mark with a mint chrome hen Steelhead. Muskegon River Steelhead Fishing was outstanding once again today, I'm not sure how long the big numbers can last but we are taking full advantage of it while they are available. Chris and his dad Mike joined me today for another epic day of Muskegon River Steelheading. Water level is still holding at a good fishing level but is clearing, warmer weather ahead should bring the last shot of runoff and more water. There are good numbers of spring Steelhead available and more showing up daily, give us a call if you want to experience some of the best Steelhead fishing in Michigan. Chris and his dad Mike with a few from today. 3/30/2011 Mike with a mint silver Muskegon River hen. 3/30/2011 Chris with an a$$ kicking 10 lb. hen!!! 3/30/2011 Father and son enjoying a day on the Muskegon River. 3/30/2011 A double header in the last spot of the day! 3/30/2011 Chris with a good chrome buck from the Muskegon River. 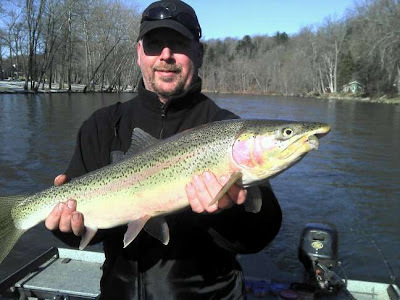 3/29/2011 Ed with a colorful Muskegon River Steelhead. 3/29/2011 Call us for your Muskegon River Charter. 3/29/2011 Todd with a big buck from today. 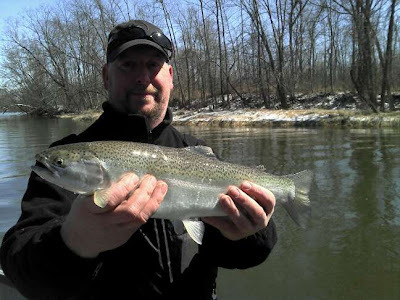 3/29/2011 Muskegon River Spring Steelhead. 3/29/2011 Todd with a gorgeous hen Steelhead. Ken, Dale, Brad and Tom joined Kris M. and myself today for what can only be described as an absolute beat down on the Steelhead in the Muskegon River. It seems that either we hit a big push of fish or every Steelhead in the river bit today, both boats were well into double digits before noon!! The water has dropped a bit but is still in prime shape for Steelhead fishing, water temp is in the low 30's. Today was the first day that it seemed all the "spots" have filled in with fish, some produced 1 while others produced up to 6. I fished the PM yesterday and was pleasantly surprised at the amount of snow pack up north which means more runoff and more water this spring! Below is some of today's fun including a couple double headers Ken and Dale put in the net. 3/26/2011 This Steelhead had and interesting jaw. 3/26/2011 Tom with an acrobatic buck. 3/26/2011 Brad with a great buck steelhead. 3/26/2011 Tom with a bright hen in the bright sun. 3/26/2011 Muskegon River Spring Steelhead. 3/26/2011 Ken and Dale with a double header. 3/26/2011 Ken and Dale with their second double header today, these guys kept my net in the water all day!! 3/26/2011 Muskegon River Steelhead Fishing was red hot today!! 3/26/2011 Ken with a nice buck Steelhead from the Muskegon River. 3/26/2011 Ken with a dandy chrome hen. 3/26/2011 Tom with a very nice buck Steelhead from the early mnorning. 3/23/2011 Reed with a nice bright male Steelhead. 3/23/2011 Reed with a chrome hen, this fish was on fire!! His smile says it all!! 3/23/2011 Joe with a nicely colored buck Steelhead. 3/23/2011 Reed with yet another Muskegon River chromer!! 3/23/2011 Me holding one of Reed's fish, pretty sure his arms were tired. 3/23/2011 Scott with a dandy buck Steelhead from the Muskegon River. Steelhead Fishing is improving each day with more and more Chrome Steelhead entering the Muskegon River from Lake Michigan. Muskegon River water level is very nice at just over 3000 cfs and a nice stain with temps in the mid 30's. Back Bouncing Spawn has been our main focus but fish have also been caught float fishing and plug fishing. We are booked up for the rest of March but have some good dates available for April so give us a call if you want to experience some of the best Steelhead fishing of the year. Have a larger group? Call about our multiple boat specials. 3/21/2011 Chrome hens were the order of the day. 3/21/2011 Back Bouncing Spawn has been very productive. 3/21/2011 Spring Chromers are here. 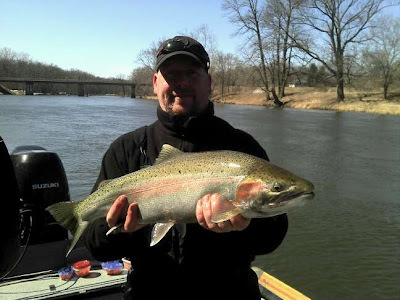 3/21/2011 Muskegon River Steelhead Fishing is heating up. 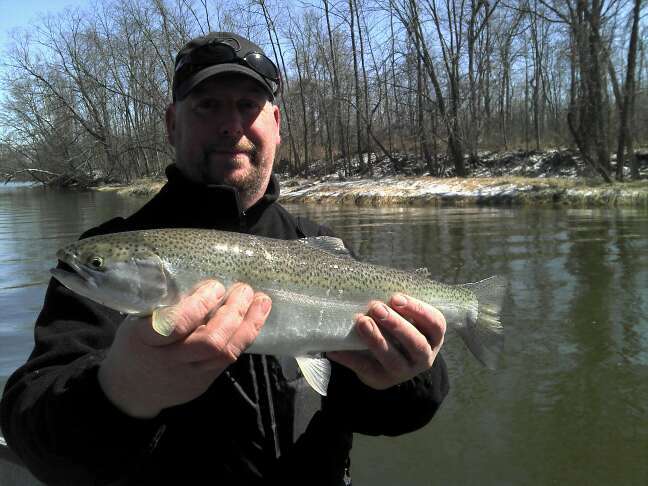 3/21/2011 Ed with another chrome Steelhead from the Muskegon River. 3/21/2011 Ed with a smaller male from today. As expected the river level stablized and the fishing is turning back on. I had a cancellation for today so Kris and I decided to hit the river for a couple hours this morning and found some willing Steelhead. Steelhead fishing on the Muskegon River should only get better through the week, the best fishing of the spring is coming! 3/20/2011 Kris with a chrome skipper Steelhead. 3/20/2011 Double header on the Muskegon River. 3/20/2011 Muskegon River Spring Steelhead. 3/20/2011 This Steelhead was on fire!! 3/20/2011 Skippers are a good sign of things to come, they usually lead a big push. Well I've been asking for water and we got it, as usual the fishing is a bit challenging while the river rises but should be great once the fish settle in and get used the increased flow. We have caught a couple winter hens that are nearly done spawning over the last couple days. Muskegon River Steelhead Fishing should be great in the coming weeks with higher and warming water. 3/19/2011 Muskegon River Steelhead from the upper river. 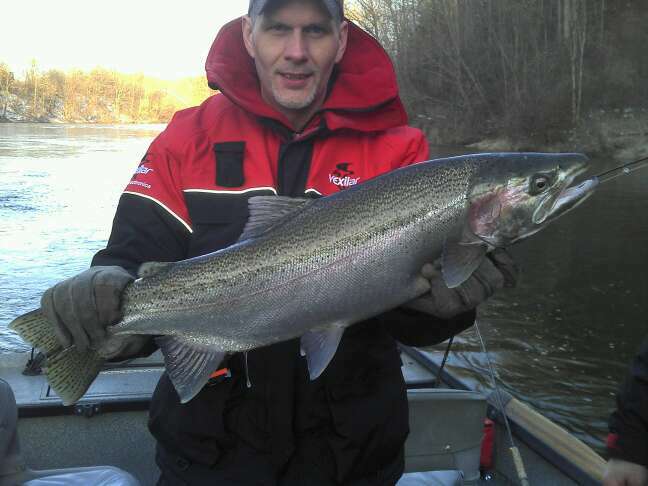 3/19/2011 Spawning Muskegon River Steelhead. 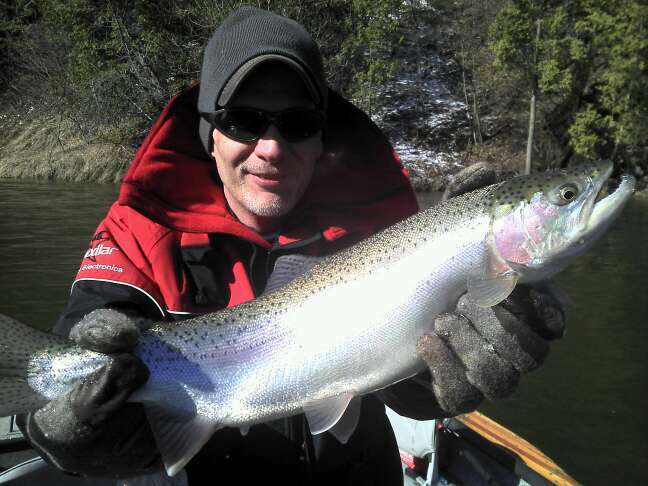 Ed and Scott had a great morning of Muskegon River Steelhead Fishing. Most of the fish today were darker with only a couple fresh fish. Water level dropped a bit over night but is still holding decent color, hopefully the rain forecasted for thursday and friday will give us the water we need, Steelhead are definately filling up on stoneflies and will continue to do so until we get a good high water. 3/16/2011 Scott with one of our brighter Steelhead from today. 3/16/2011 This buck Steelhead wanted a meal. 3/16/2011 A nice buck Muskegon River Steelhead. 3/16/2011 Scott with the big fish of the day. 3/16/2011 Ed with a late morning Steelhead.